June 23rd's full moon, known as the Strawberry Full Moon, was the biggest and brightest full moon of 2013 - a 'supermoon' in modern parlance. The technical name for this special combination is the perigee-syzygy of the Earth-Moon-Sun system. 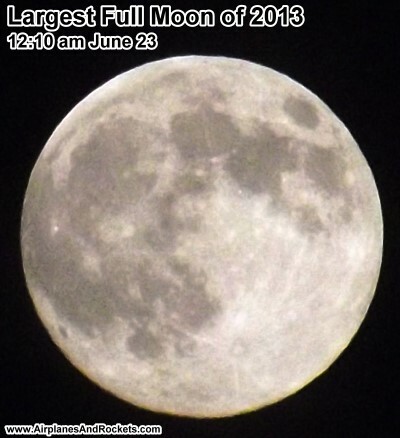 The moon reached perigee at 7:00 am EDT, and fullness at 7:32 am. The moon is full when the earth is between the sun and the moon, and the moon is new when it is between the sun and Earth. The picture below was taken out of my from porch, at around 12:10 pm local time (Erie, PA), with an outside temperature of around 75 °F. Because of widespread cloud cover, it took about 15 minutes of waiting with my finger on the shutter button to finally get a break large enough for the entire moon to show through. On average, the moon is 238,855 miles (384,400 km) from Earth. Its orbit around the earth causes it to go through all its phases once every 29.5 days. Since the orbit is elliptical with the earth in one of the foci, one side of the orbit is 31,070 miles (50,000 km) closer than the other. So in each orbit, the moon reaches this closest point to us, called perigee (apogee is the farthest point). Occasionally perigee coincides with a full moon, as it did on this night, making the moon bigger and brighter than any other full moons of the year. Tonight it appeared about 12.2% larger than it will look on January 16, 2014, when it will be farthest from Earth during its apogee. Note: When is it proper to capitalize 'Earth?" Only when the word is used as a proper noun; i.e, a name. For example, you would write "The moon orbits the earth" and "The moon orbits Earth."